Robots in one form or another have engaged the popular imagination for centuries. Now, on the cusp of the 21st century, they are poised to saturate every aspect of our culture, from medicine, science, and industry to artworks, toys, and household appliances. Whether playing prominent roles in movies like I, Robot or helping mankind explore the surface of Mars, robots seem to be taking over the world. Robots is the first visual survey to focus on this increasingly important, always newsworthy scientific development and its effects on society. 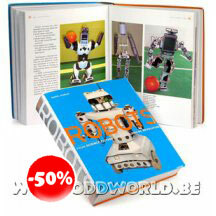 Covering automatons, androids, and all manner of artificial intelligence, both fictional and real, this massive, comprehensive volume describes the robot's fascinating history and speculates on its probable future. 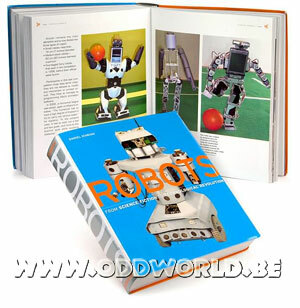 Interviews with scientists, surgeons, manufacturers, science fiction writers, artists, toy creators, and a host of other experts bring tremendous insight to the subject, and the copious illustrations provide visual examples of robots in every environment imaginable. As entertaining as it is informative, this one-of-a-kind book is an indispensable guide to the rapidly approaching Robot Age.